Endocarditis is heart disease caused by inflammation of the valve or endocardium wall. Endocarditis is divided into infectious and noninfectious. Bacterial endocarditis or infective endocarditis is a disease which is caused by bacterial infection in the endocardium, a mixture of fibrin, platelets and microbes. Bacterial endocarditis or septic endocarditis can be divided into two groups: acute bacterial endocarditis and subacute bacterial endocarditis. A patient with rheumatic or congenital heart disease. Long-term fever, weight loss, joint pain and muscle pain, fatigue and anemia. Heart murmur, petechiae, emboli phenomena. Subacute bacterial endocarditis (SBE) is a flammable bacterial infection of the endocardium and usually builds on a rheumatic valve or a congenital heart disease. The initial causes of a bacteremia is respiratory infections, interventions on teeth or cystoscopy. But in most cases the source of infection is not known. Etiologic factors are: non hemolytic streptococcus, streptococcus viridans and s. faecalis, staphylococci occasionally, but every other microorganism can be considered. Bacteria settle in the endocardium valve. Fibrin accumulates and at the same time comes to platelet thrombus formation. Dissemination of bacteria in the blood from already an altered valve can lead to the development of the aneurysm, which sometimes, however, rarely, can rupture. It can be present as an active rheumatic carditis. Subacute bacterial endocarditis can develop from modest to moderate systemic symptoms: cerebral, renal, splenic or mesenteric embolism, heart failure, or any combination of these. After this bacteraemia can appear from one of the sources, in the within few days or weeks. Acute bacterial endocarditis (ABE) is a progressive infection of normal or a variable valve and usually develops with a severe bacteremia from acute infections such as pneumonia pneumococcus, pelvic infection or abscess. It can also occur as a complication after surgery or after a heart surgery on infected tissue, after criminal abortion, pneumonia, abscess, sore throat, erysipelas, thrombophlebitis, etc. Often the infection is the result of metastasis from congenital or acquired heart disease or endocardium. The most common pathogens causal agents are: pneumococci, staphylococcus aureus, hemolytic streptococcus, gonococcus and gram negative coliform organisms. Acute bacterial endocarditis creates great weathered forms of bacteria which causes severe occurrence of metastatic abscess, fast perforation, breaking and destruction of the changed valves or rupture of the chordae tendineae. The risk of infective endocarditis is 30 times higher than in the general population, and 4 times higher than in the patients with rheumatic heart disease in people who abuse drug or have increasing number of different invasive medical procedures. Men suffers from infective endocarditis is 2-3 times more often than women. The most important factors that have contribution to the emergence of bacterial endocarditis is the existence of various earlier acquired and congenital abnormalities of the heart. The risk of infective endocarditis is much higher in small size heart defects than in large ones. Significantly increases susceptibility for infectious endocarditis is after implantation of foreign material in the heart, mainly prosthetic valves. Clinical presentation of infective endocarditis is very polymorphic, due to a variety of its manifestations, many of which can be missing. Fever is present in all cases, although fever may be present for a febrile period. Following symptoms can be present: sweating at night, chills, malaise, fatigue, anorexia, weight loss, vague muscle pain, redness and swelling of joints, sudden changes in the eyes, hemiplegia caused by cerebral embolism, pain abdomen, thorax, changes on one side of the body caused by mesenteric, renal, or a pulmonary embolism, bleeding from the nose, bruises and symptoms of heart failure. Increased body temperature is one of the most frequent manifestations of bacterial endocarditis and is found in a particular period of its development in 85-90% of patients. In acute bacterial endocarditis development is more turbulent and patient is very intoxicated. Moderate enlargement of the spleen is seen in 30-40% of patients. Clinical manifestations of infective endocarditis is heart murmurs and signs of congestive heart failure. Much less common is heart blockage and pericarditis. Heart murmur is present in approximately 80-90% of patients, and in subacute bacterial endocarditis is more frequent up to 95% and it is accompanied by tachycardia and other signs of aggravated heart failure. The subacute bacterial endocarditis is usually a rheumatic or congenital heart disease. There can been present splenomegaly, tachycardia, petechiae on the skin occur in about 10-15% of patients usually appear in groups 2-3 days and fade away and disappear without a trace, mucous membranes, then finding on the fundus, bleeding beneath the nail in longitudinal direction before reaching the edge of the nail, cubbing fingers and toes, pale or tawny color, neurologic findings after cerebral embolism, sensitive red nodules on fingers and legs, usually multiple, diameter of 2 – 5 mm, which are located on the fingertips and toes, they are found in approximately 10-15% of patients with advanced subacute infective endocarditis, and less than 10% of patients, with its acute infective endocarditis. Heart murmurs can be considered irrelevant when it comes to infections tricuspidalis valves and valvular pulmonary artery. However, with repeated pulmonary infarction due to pneumonia, heart murmurs can be very characteristic signs. In elderly patients clinical picture is often atypical. Acute bacterial endocarditis is in fact a serious infection associated with fever, high temperature, extreme fatigue and with severe and multiple occurrences of embolism. This could build on the previous causal infection (pneumonia, furunculosis, pelvic infection) or may occur suddenly after surgery. 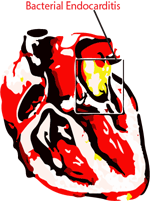 Heart murmurs can change rapidly and heart failure expires earlier. Acute bacterial endocarditis may develop during prophylactic and inadequate treatment with antibiotics. In these cases, the changes are masked and as the first warning sign, suddenly embolism, then petechiae, unexpected heart failure, altered murmur or high temperature can occur. Congestive heart failure is the most common and most severe complications of infective endocarditis, much less important is myocarditis and he is more common in acute bacterial endocarditis, but it can also occur in the subacute bacterial endocarditis. Complications in the presence of acute bacterial endocarditis and subacute bacterial endocarditis may include peripheral arterial embolism which leads to hemiplegia or aphasia, bowel infarction, kidney or spleen, or acute arterial insufficiency of the hand or feet, congestive heart failure, embolism may be the first sign of infective endocarditis, renal failure, bleeding, anemia, and create metastatic abscesses especially when it comes to acute bacterial endocarditis. Splenic abscesses may have adversely affect to the effect of therapy and even lead to the initial state. Pericarditis in bacterial endocarditis can be aseptic and purulent. Mycotic aneurysm of peripheral arteries are rare complications of infective endocarditis. Subacute bacterial endocarditis must be differentiated from patients with a variety of similar conditions. Hemiplegia, persistent heart failure, anemia, bleeding fondness or uremia may be caused by the subacute bacterial endocarditis. If a patient has any of these diseases in addition to temperature and even a heart murmur, it is necessary to take hemoculture. Laboratory methods used in the diagnosis of infectious endocarditis include common blood and urine tests to determine levels of acute phase reactants and some immunological parameters. A significant proportion of patients with infective endocarditis have nonspecific changes in the general analysis of urine in the form of a small proteinuria and microhematuria. There is also increase the level of immunoglobulin, appearance of rheumatoid factor. Specific illnesses that require to be differentiate are: lymphoma, thrombocytopenic purpura, acute rheumatic fever, disseminate lupus erythematosus, chronic meningococcemia, brucellosis, tuberculosis, non-bacterial thrombotic endocarditis or chronic disease with weight loss. Acute bacterial endocarditis cover a severe systemic reaction to the apparent pre-existing infection. It can be recognized only if you notice the rapid clinical deterioration, bacteriemia, the occurrence of sudden cardiac murmur changes, heart failure and massive embolic attacks, especially in the CNS, which give a picture of meningitis. Important for the diagnosis and treatment evaluation of bacterial endocarditis is information on presence and severity of regurgitation of blood through the affected valve, and indicators of the size and function of the ventricles. Treatment for infective endocarditis can be medical and surgical. The basis of medication therapy is antibiotic therapy. To improve the effectiveness and safety of treatment with antibiotics, therapy allows correction of dosing antibiotics, because cells and fibrin layer due to low activity of metabolic processes are often characterized by high resistance to antibiotics. Surgical treatment for bacterial endocarditis is to replace the heart valves, surgical mortality depends on the severity of illness and ranging from 5 to 30%. Bacterial endocarditis in generally is fatal, unless the bacterial infection is destroyed, but in some cases surgical solution of A-V fistula or persistens ductus arteriosus may lead to a cure. The percentage of recovery in subacute bacterial endocarditis ranges from 30 to 80%, much lower than it is in acute bacterial endocarditis 5-40%. A poor prognosis have the patients with negative blood culture and prolonged treatment, then those with very high resistance to antibiotics. If the bacteriological treatment is completed, the prognosis depends on adequate cardiovascular function. Significant impact on health outcomes is the etiology of infective endocarditis. Only about 50% of patients feel good five years after a cure of bacterial endocarditis. Aortic insufficiency has the hardest prognosis and requires appropriate surgical intervention. Worst prognosis have embolism which affect the brain. Relapse of infective endocarditis occur in 5-10% of patients and most often occur in the first 4 weeks after discontinuation of antibiotic use.